Edmonton Mayor Stephen Mandel announced his plans to retire after three-terms in office. EDMONTON - Alberta Tory leadership candidate Jim Prentice has a former big-city mayor in his corner. 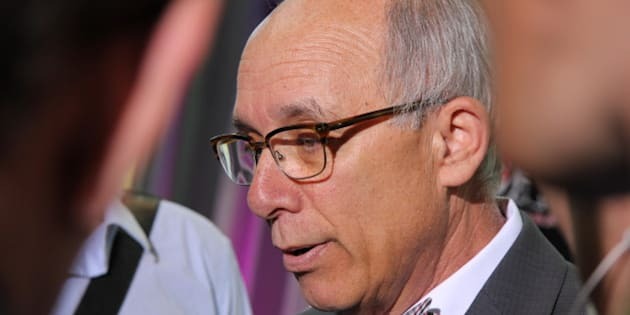 Edmonton's Stephen Mandel announced Tuesday that he is endorsing Prentice and will help him in his campaign leading up to the party vote in September. Mandel said he will sell memberships and organize events in the Alberta capital. "He (Prentice) is a progressive conservative. And progressive is the most important word," Mandel told a joint news conference with Prentice. "We are a city that is a very progressive city and we need someone at the helm of this province who will bring great vision and great opportunity for all of us. And Jim Prentice is that person." The 68-year-old Mandel, a three-term mayor who didn't run in last fall's municipal election, did not rule out the possibility of running provincially under Prentice in the next election. "The cards will fall where they fall. I don't know right now," he said. When reminded that he had said he left the mayor's chair to step away from the political spotlight and spend more time with his family, he jokingly replied: "I've had some time with the family." Mandel is a Progressive Conservative party member, who had grown disenchanted under the leadership of former premier Alison Redford. In January, he told a newspaper columnist he would not run under Redford's leadership. While not mentioning Redford by name, he said her administration had failed to follow through on promises to develop cities and to properly fund post-secondary institutions. Prentice has promised a new deal with Edmonton and Calgary to address infrastructure, transportation and administrative issues. He said that deal could include more autonomy for the cities if necessary. "I'm prepared to have that discussion with both of the mayors," said Prentice. "We need to be creative and innovative." He noted the provincial population sits at four million people and is rising. "When we get over five million people, 80 per cent of those people are going to be living in the two major cities," he said. "So we owe it to the citizens of Edmonton and Calgary, and Albertans, to focus on these issues and come up with solutions." Prentice is running against former Redford cabinet ministers Thomas Lukaszuk and Ric McIver. On Tuesday, Lukaszuk launched his campaign website. On the site, Lukaszuk recounts how as a child he fled communist Poland with his family and then struggled in Canada to learn English. "This experience gave him a lifelong respect for talented and compassionate teachers, and an appreciation of the challenges faced by non-English-speaking immigrants," reads his biography. Prentice's team also has a website, while McIver's site is still under construction.